An 11 day trek through some of the greatest scenery in Europe. The Tour Du Mont Blanc is rightly the most popular long distance hike in Europe. Spectacular views of Mont Blanc itself, plus too many other snow capped summits to count, glistening glaciers, flower filled valleys, alpine villages and the opportunity to experience three different countries on one trip. Mont Blanc is more than just a single big mountain, it is a full mountain range, which is compact and complete in itself. The 25km range has about 400 summits and more than 40 glaciers that tumble and fall from the peaks. It forms the border to 3 of Europe’s major countries in France, Switzerland and Italy which we pass through on our journey. Also radiating from the range are the valleys of the Arve, Montjoie, des Glaciers, Val Veni, two vals Ferret and the vallee du Trent and the route passes through and over each of these. We have also included luggage transfer in the price for this year, so you hike with a daypack carrying your essentials for the day. There are just three nights when this is not possible, because of no road access to our accommodation. However, on the nights where we do not get luggage transfer, our luggage is simply transported to the following nights accommodation. Therefore on these nights, you just need to take a few extra overnight items. The 2018 Tour Du Mont Blanc Trekking holiday follows the route of the most popular long distance hike in Europe. Spectacular views of Mont Blanc itself, plus too many other snow capped summits to count, glistening glaciers, flower filled valleys, alpine villages and the opportunity to experience three different countries on one trip. We will take 11 days for the 2018 Tour du Mont Blanc trekking holiday and will be following the traditional route (anti-clockwise) as we pass through France, Italy and Switzerland, on our way to completing a full circuit on our 2018 Trek. Staying in a mixture of simple, but comfortable, accommodation we will also be hiking as a group each day with just our day packs. Our main luggage is transferred for us to our accommodation each day (apart from 3 nights). On our Tour du Mont Blanc Trekking Holiday each day is guaranteed to be different as we experience the scenery changing before our eyes, while we hike a total of 105 miles and climb a total of almost 10,000 metres. 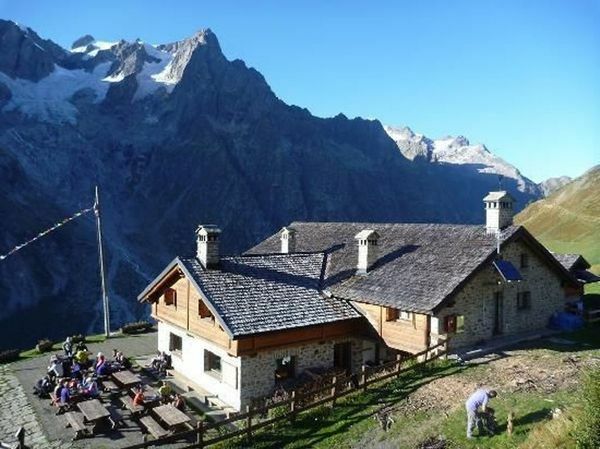 A typical day on the 2018 Tour du Mont Blanc Trek involves leaving our village, or alpine hut early and climbing up to one of the passes, where we will get great views of shining glaciers and summits, followed by a descent into the next valley, where will reach our accommodation in early to mid afternoon. We can then relax with a beer and enjoy the view, read, or nap before dinner. Guardian review of Tour du Mont Blanc Trek. Follow these links to the Blog Pages to see some of the photos and read about previous trips. I’m still on a high from completing the Tour du Mont Blanc trek with Kevin and Yen in July. A great challenge and hard going, especially the descent on the last day. Kevin was a fantastic guide and very knowledgeable – ‘slow and steady’ was the climbing mantra. The organisation by Yen was brilliant with a varied and quirky set of refuges. We had an amazing group of fellow trackers and the weather was perfect. Looking forward to doing other treks with Mountain Hikes in the near future. A big thank you again to Kevin and Yen – you made this a trek to remember. Thank you again for everything. It was such a great trip. So smooth – the nicest element was not having to use my brain at all, which is down to your excellent organisation! I just wanted to say a huge thank you to you both for the TMB holiday. You both took so much care and thought to make it as good as it could be for each and every one of us. It was no mean feat to guide us all safely round the course without mishap – and to find the way without any fuss – you seemed to know where to go without ever looking at a map (or perhaps I just wasn’t at the front of the line to see you!) It all went so smoothly and amiably – you managed to keep the diverse group happily together with good humour , and time the pace and stops as well as it could be for so many people. The difference between your outfit and the commercial companies is the personal touch – the sense that you care about getting it right – and you certainly did (get it right). A special thank you to you, Yen, for your unfailing good humour and patience at the end of the line! I don’t know how we would have fared without you – you’re an absolute star, and I’m very grateful. The Tour Du Mont Blanc is a complete circuit of Mont Blanc and we hike a total of 105 miles (170km) and climb a total of about 10,000m over the 10 days we are on trek. This means that each day on average we will climb about 1000m and descend a similar distance and hike for about 10 miles. Each day the actual distances and height varies from the average and some days are longer this. There are several variations as we travel round the circuit and so generally we will take an easier option where one is available. There is an rest day in Courmayeur on Friday 27th July. Courmayeur is a thriving Italian town with good facilities, and we stay in twin rooms, so it is a good opportunity to rest and recharge and explore a little if you wish. The hiking is all on good paths and trails, but as are on a multi-day trek, the days can sometimes be quite hard. It is therefore important that you are either fit already, or you are an already experienced hillwalker who has done at least one multi-day trip. If you are not prepared, then the hike can be very tiring and it is unlikely you will fully enjoy it. We will be staying in varied accommodation throughout. From simple hotels where we will have twin share rooms with a mixture of private/shared and ensuite facilities, to very simple Alpine hut accommodation which have shared bunks for sleeping. During the tour, when we have shared dormitory accommodation, the beds will be bunk beds or alpine style, continuous mattresses, with shared facilities. For those not used to dormitory style sleeping, it does take getting used to, but it is also part of the “alpine experience”, where communal living and shared sleeping is the only way to experience the high mountains. All accommodation along the tour however, does have showers. Breakfasts are usually very simple whilst dinner is usually three or even four courses! **For those interested, there is the option to go into Chamonix on the departure day and take the Aiguille Du Midi cable car up to 3842 metres. It is the highest cable car in Europe and from the viewing platform we get even closer views of Mont Blanc. The cable car is an amazing engineering feat in itself and it travels 2747 metres in 20 minutes and would make a fitting end to the trip. Approx return cost is €60. 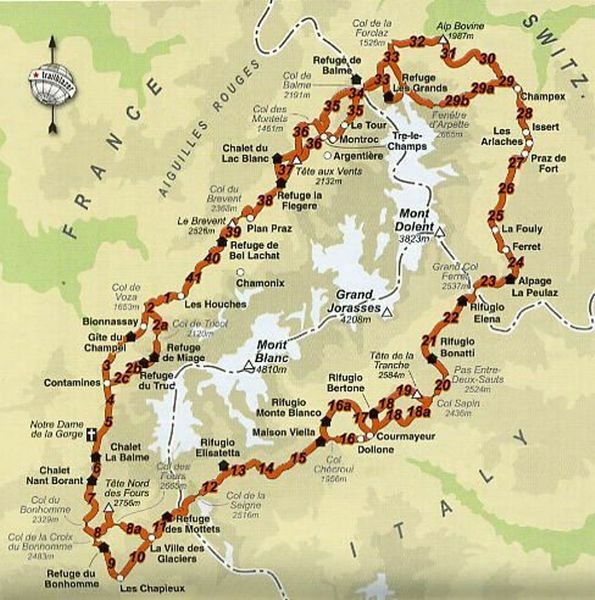 *** There is no road access to these locations, so it is not possible to transfer luggage on these nights (Combal, Bonatti, La Flegere). You should pack a change of clothes and overnight things in your day pack and your luggage will simply be shipped to the following nights accomodation. To book, click add to basket and then checkout to pay your initial deposit of £250. The remaining payment of £1000 is paid in two staged payments of £500, four months before departure and £500, two months before departure. These payments should be made by bank transfer and our account details are below. Please note that the deposit is non-refundable. 2 dinners (at middle 2nd night in Courmayeur and end of the tour in Les Houches) – we shall eat out as a group. transfers to and from Geneva airport to Les Houches, Chamonix and flights. Our prices are listed in UK pounds and calculated on 1st October 2017 based on the current exchange rates. However we have to pay for accommodation and food in Euros and in Swiss Francs during the trek. Therefore we reserve the right to charge a supplement in the event that the exchange rate changes by more than 10% between 1st October 2017 and date of departure. We would suggest flying out from the UK to Geneva – there are plenty of low cost airlines that fly out from various airports. We will meet at our hotel in Les Houches at around 6pm, for a short briefing and introduction, then have dinner. From Geneva, it is about an hour transfer to our rendezvous point in Les Houches in the Chamonix valley. Transfers can be booked at www.alpybus.com or www.chamexpress.com or www.mountaindropoffs – all offer a similar service in the region of approx €40-50. Mountain drop offs tend to have slightly better quality minibus, but are a few euros more, Alpybus has an easy booking system and you pay in cash at the end of each journey and it is also the cheapest. You should note that it is usually not possible to take walking poles in hand luggage. Therefore, to save everyone paying for checked in baggage, if anyone is travelling together, we would suggest you check in one piece of luggage. Please note that for the luggage transfer, the company ask that you bring a ‘soft’ bag and not a wheeled or hardcase bag. The weight limit for the luggage transfer is 15kg and no perishables or valuables should be inside.